Revisit your childhood and turn that bicycle into a tricycle. Or, more practically, transform your bike into a cargo-lugging machine with the farcically titled S-cargo carrier. You’ll be the envy of your block. Israeli designer Ofir Yadan created this piece of utilitarian biking hardware for his graduation project at Jerusalem’s Bezalel Academy of Arts and Design. 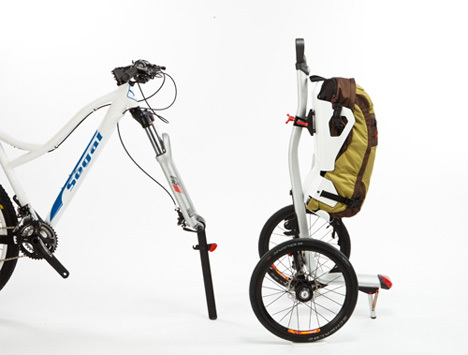 The invention has two wheels and replaces your bike’s standard front wheel. Its current prototype form comes with a knapsack-like section that’s perfect for transporting your groceries. The next version is expected to feature accessories like racks, boxes or child seats. 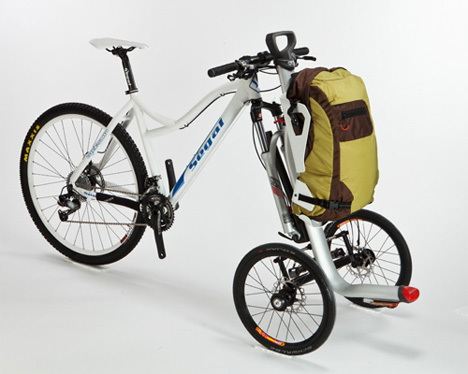 One of the coolest features of the S-cargo is that once removed from your bike’s drop-outs, it can be readily removed and pulled by its handle as a cargo dolly. While still in prototype form with no actual plans for mass production, I’m sure it will easily capture the interest of both cyclists and environmentalists. See more in Mods & Custom or under Transportation. June, 2013.